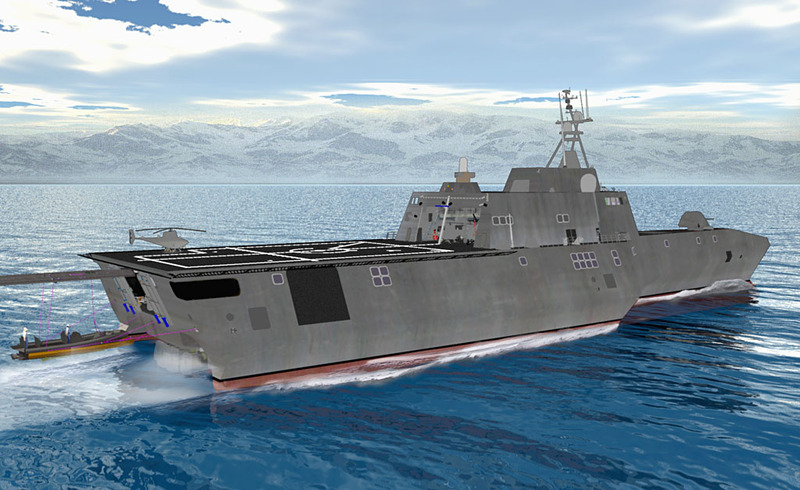 General Dynamics (70,000 employees) and subsidiary Bath Iron Works (6,200 employees) have been contracted by the U.S. Navy to design, develop and manufacture the next generation of close shore, surface combatant ship called the Littoral Combat Ship (LCS). 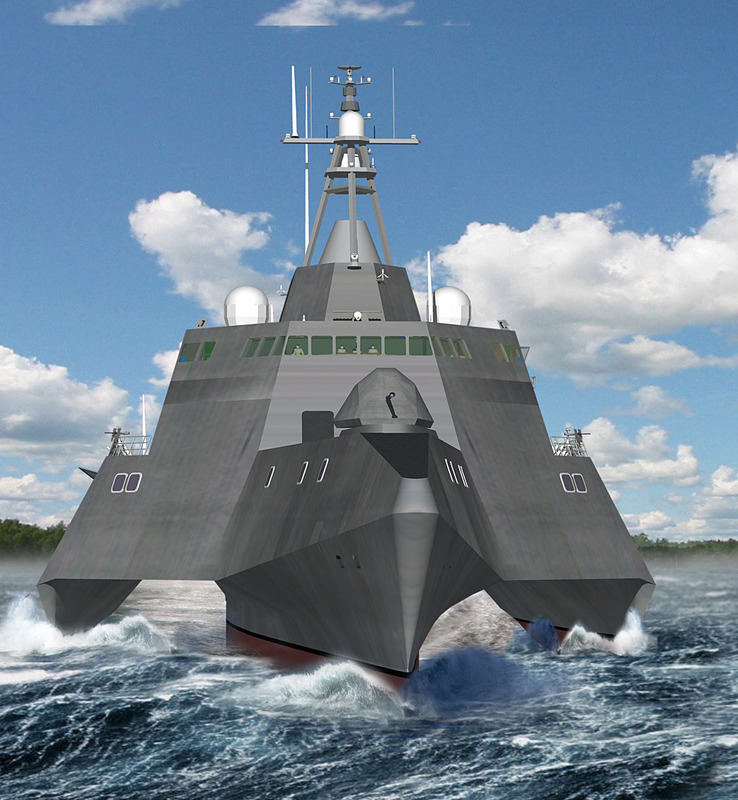 The General Dynamics LCS concept features an innovative trimaran hull and open architecture design to provide superior joint warfighting capability and flexibility to accommodate planned and emerging mission growth and system upgrades. 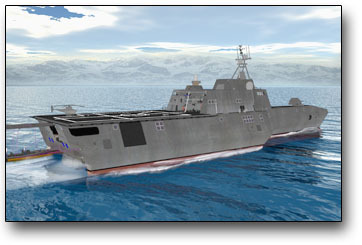 Bath Iron Works of Bath, Maine, is the prime contractor for the General Dynamics LCS Team. 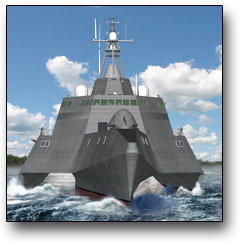 The CAD geometry for the LCS ship was created in Delmia V5 by William Farabee, Principal Project Manager. The primary challenge was how to migrate this vast array of CAD data into 3ds Max for further manipulation, rendering and animation. 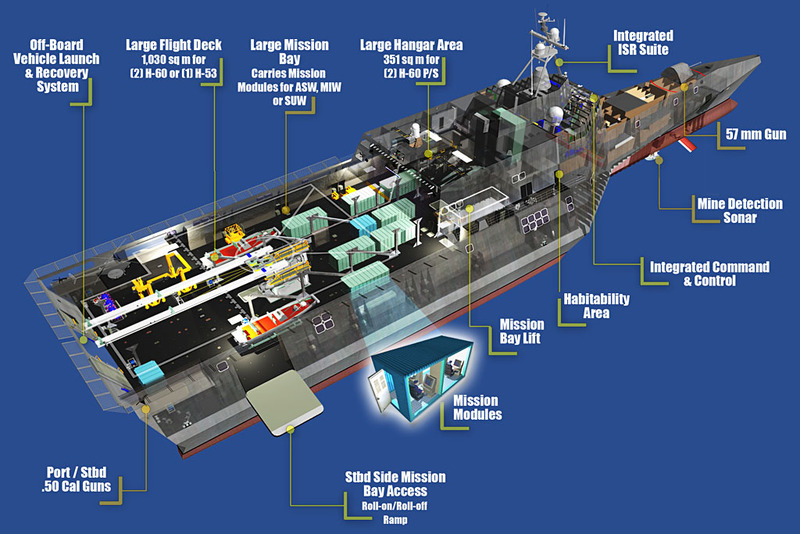 The final goal was to design a set of PDF documents and WEB pages documenting, exploring and explaining the LCS concept. 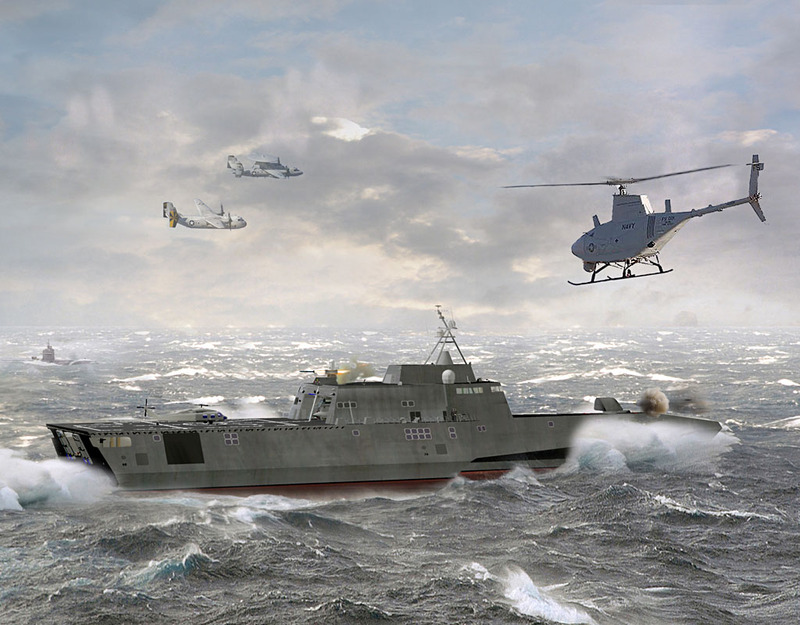 David Heath, media specialist of Bath Iron Works, chose Okino's long-established PolyTrans-for-3dsMax CAD conversion pipeline as the main method to transfer, downsize and optimize the large Delmia v5 datasets. 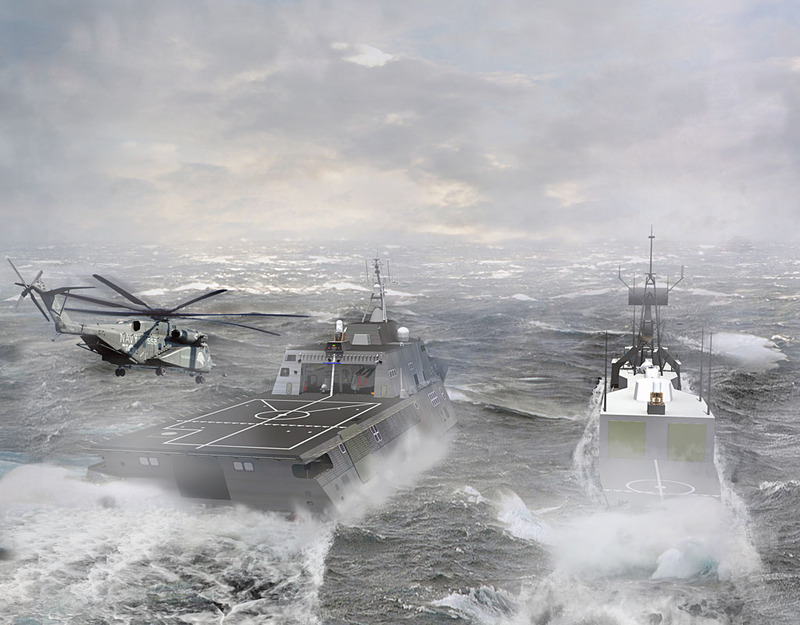 Half of Okino's user base consists of users similar to David in the military, aerospace, manufacturing, automotive and corporate markets. Okino pioneered the concept of seamlessly bridging the CAD world with the non-CAD/animation/multi-media world, and as such can offer ideal and robust conversion solutions. "Okino's PolyTrans provided the optimal CAD conversion solution with their PolyTrans-for-3dsMax bridge. I was able to take the output from Delmia V5 and run it thru not only the translation engine in PolyTrans, but also the hierarchy and parts count optimizer that created direct, useable geometry datasets. I have found that using PolyTrans has enabled me to create optimal models for use in marketing graphics/animations and high-end renderings. The level of detail and control I have over the translation process provides the ability to refine the translation and create larger models on the 3ds Max end, and create more stunning views. 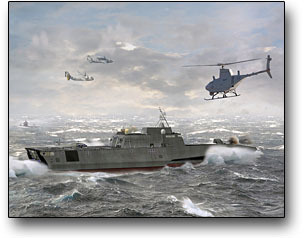 I would not have been able to create these complex images (see above) without the polygonal reduction and geometry optimization tools built into PolyTrans. I have since used PolyTrans-for-3dsMax on every project I have worked on dealing with data from other 3D geometry sources. Thanks go to Okino and PolyTrans for helping me to transform the CAD data I needed in an efficient and quality manner." 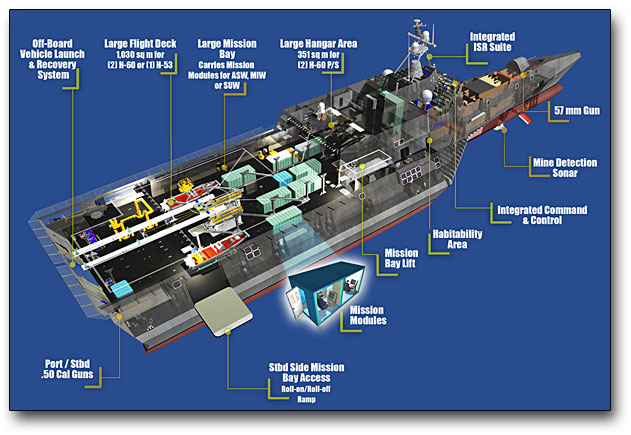 All graphics are Copyright General Dynamics and Bath Iron Works, All Rights Reserved. 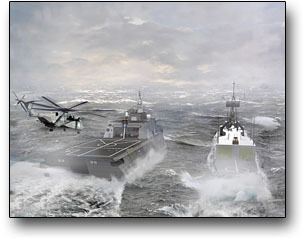 No images may be reproduced without the explicit permission from General Dynamics or Bath Iron Works, permission which Okino Computer Graphics has received.